Postal address: H-7400 Kaposvár, Guba S. u. 36-40. During the hunting season 2012-13 we investigated occurrence of the Thorny-headed Worm Macracanthorhynchus hirudinaceus in 7 hunting areas. We dissected 618 wild boar (Sus scrofa) viscera. Worms were present in 4 areas, with a prevalence varying between 4.3-100%. M. hirudinaceus mostly occurred in areas characterised by sandy soils and a high density of cockchafers (Melolontha spp., Rhizotrogus spp.). 1. Jánoska, F., Kemenszky, P., Farkas, A., Varju, J. & Horváth, Zs. (2016): Artificial nest predation investigations at a varied habitat in Somogy County, Hungary. Bulletin of Forestry Science, 6(2): 161-173. 2. Náhlik, A., Sándor, Gy. & Tari, T. (2013): Birth rate and offspring survival in a free-ranging wild boar Sus scrofa population. 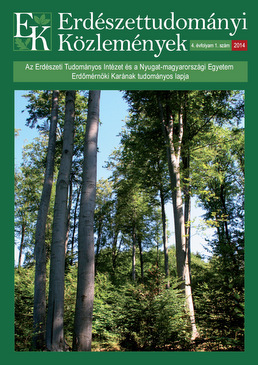 Bulletin of Forestry Science, 3(1): 261-269. Jánoska, F., Kemenszky, P., Farkas, A., Varju, J. & Horváth, Zs. (2016): Artificial nest predation investigations at a varied habitat in Somogy County, Hungary. Bulletin of Forestry Science, 6(2): 161-173. Náhlik, A., Sándor, Gy. & Tari, T. (2013): Birth rate and offspring survival in a free-ranging wild boar Sus scrofa population. Bulletin of Forestry Science, 3(1): 261-269. Nagy, G., Ács, K., Csivincsik, Á., Varga, Gy. & Sugár, L. (2014): The occurrence of Thorny-headed Worm Macracanthorhynchus hirudinaceus in Transdanubian wild boar populations in relation to certain environmental factors. Bulletin of Forestry Science, 4(1): 197-206. Opening a web page!